When you step into Keane's, while the facilities are modern and comfortable, the atmosphere is one of stepping back in time. 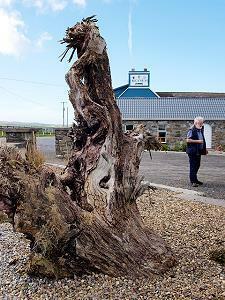 Situated 3 kms from Kilkee on the main Kilrush-Kilkee road (N67), it has grown from shop to pub, to restaurant, to function facilities and accommodation, all the while catering for local, national and international alike. The site of the bar has been occupied by the Keane family since 1641 and today it is owned and managed by Michael + Bridie, assisted by daughters Aisling + Lorraine. It is very much a hands on business with Bridie in the background baking bread and making desserts, supervising the pub and responsible for accommodation, while Aisling + Lorraine manage the restaurant. The Keane family and staff strive to make your visit an enjoyable and memorable one. has long been one of Co. Clare's main holiday resorts. Attractions include safe swimming, walking, tennis, squash, golf, pitch and putt, children's amusements, free-diving and surfing. The area offers quite a few natural amenities around its horseshoe-shaped bay. The Cliff scenery all along to Loop Head Lighthouse though is one of Kilkee's greatest natural attractions. Loop Head Drive will take you to numerous scenic outlooks as well as to cliff angling spots. A variety of rare birds, dolphins, whales and seals appear regularly on and around Loop Head Peninsula. 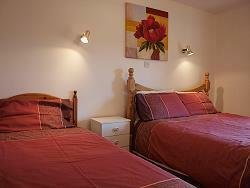 Accommodation in twin, double and family bedrooms as well as bedroom units with kitchenette are available. All rooms are ensuite, with color TV and have own access. Select from a wide option of accommodation facilities. Available are Twin and double bedroom units with kitchenette as well as double bedroom units with full kitchen. The Restaurant is open year round with a full menu served daily. Meals are served from 5:30 pm with flexible closing hours. The staff earnestly strives to meet your dining requirements. 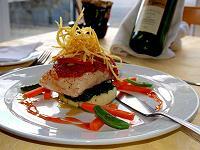 The food ranges from continental specialties to local favorites. Naturally, oysters are a specialty and when accompanied by a pint of Guinness, one could hardly ask for more! The oysters are harvested by Michael fresh from his own beds in the waters of the Shannon Estuary! Christmas parties, Special Birthdays, Wedding Rehearsal Dinners are easily accommodated in the purpose built room with a choice of menu available for groups up to 80. Decorating the room according to the appropriate theme is encouraged. You will have the privacy and convenience of enjoying your party as it suits you. Walk into the Pub at Keane's and experience the warmth and comfortable atmosphere of a " local" wherethere are no strangers, only friends you've yet to meet. 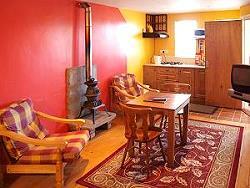 The glow of the peat fires in the adjoining rooms invites the visitor to draw near. 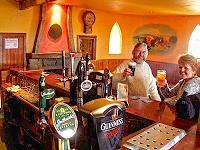 Original handpainted murals reflecting scenes of the locality enhance the walls in the fully equipped bar. 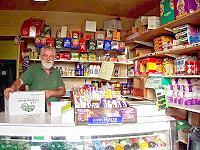 Long before " convenience stores" the Irish " shop" provided the necessities of life at all hours of the day or night. Keane's shop has been serving the public with the basics, catering to their own guests as well as their neighbours when a drive to Kilrush or Kilkee was not suitable due to time limitiations or weather. We'll be happy to answer your questions, take your bookings or respond to any comment you should have regarding our web site or your stay at our complex. Thank you for your visit to our website! Looking forward to welcoming you at Keane's!